Community Alliance for Global Justice stands in solidarity with the activists who experienced horrific violence carried out by white supremacists throughout last week’s acts of domestic terrorism in Charlottesville, Virginia. As an anti-racist organization, CAGJ’s work for food sovereignty and justice are dependent on the success of the Black Lives Matter movement and the eradication of white supremacy, anti-Semitism, and fascism from our society. The corrupt food systems that we challenge every day in our activism for healthy, ethical, and sustainable food are directly linked to the history of slavery and racism being confronted right now in Charlottesville. We must understand the linkages that build our movement: our unsustainable and unjust food systems are based in the physical and political exploitation of black people in this country. For hundreds of years, oppressive slave labor and indentured servitude formed the backbone of the US agricultural economy and created a platform for the privileges Americans benefit from today. Currently, our agricultural economy and food systems continue to be buoyed by people of color, especially immigrants, at their expense. We must step up to condemn and change policies that are complicit with white nationalism, anti-Semitism, and other forms of racism and xenophobia. To better understand how food justice links with racial justice, we’ve included some helpful resources below. As white supremacists use violence and hate to target our communities of black and brown people, indigenous people, immigrants, queer and trans people, Muslims, Jews, and other marginalized groups, we strongly encourage members of our Food Justice Project, and activists across CAGJ’s organizing, to participate in rooting out the racism that underlies our struggle for food sovereignty and fair local and global economies. In solidarity with the on-the-ground work in Charlottesville, the organizers there have asked for your support with the eight actions (outlined below). We pledge to continue standing with you all against racism in all its forms as we build the future we wish to be a part of. P.S. Tomorrow, SAT Aug 26, there is a Black Lives Matter March Against Hate and Racism at 6pm leaving from Westlake Park. We hope you will show up to unite against racism, hate, and intolerance in our city. More details on the Facebook event. Provide financial support for Black organizers as well as victims of violence Friday and Saturday, especially people of color. Call the office of Judge Richard Moore of Charlottesville to urge him to dismiss an upcoming court case disputing the ability of the City Council to remove the Robert E. Lee statue that white supremacists are defending. 434–970–3766. Petition the administration at the University of Virginia to publicly denounce white supremacist alumni Richard Spencer and Jason Kessler. Petition Mayor Mike Signer and Councilwoman Kathy Galvin to change their votes against removing the Robert E. Lee statue and also to remove all other confederate monuments. Do the research to identify Nazis in your community. Do not allow your community to be a platform for white supremacist fascism. Organize community defense networks to protect and defend each other now. And finally, there is a direct connection between white supremacist fascism and everyday white supremacist state policies and practices. Continue to organize to end racial oppression and make reparations, in line with the Vision for Black Lives. 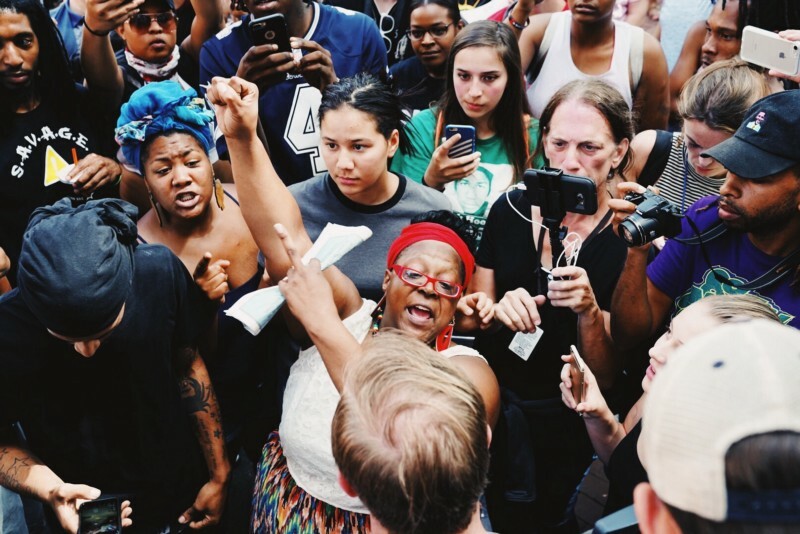 Death in the streets—and the fields: The privilege, promises and violence of white supremacy by Eric Holt-Gimenez, Food First. This piece, published August 17, was written in response to Charlottesville and the death of a farmworker in WA. 4 Not-So-Easy Ways to Dismantle Racism in the Food System by Leah Penniman, Soul Fire Farm. Backgrounder: Dismantling Racism in the Food System by Food First. The Color of Food 2011 report by Yvonne Yen Liu and Dominique Apollon, the Applied Research Center. Leaders of Color Discuss Structural Racism and White Privilege in the Food System on Civil Eats with many contributing writers. Dismantling Racism in Community Food Work 2004 paper by Rachel Slocum.